Where Are My Kids When I Need Them? The toilet paper roller was empty. Half way through “using the facilities” is always when you notice this. And there was not a child to be found. What is strange about this is that, for the past 17 years, I have not gone to the bathroom alone or uninterrupted. If you’re a mother you know what I’m talking about. When they are really little, you take them with you because it seems like an infant should be in your sights at all times. When they’re a little older, you take them with you lest they hurt themselves or a younger sibling. Then, it’s time to potty train them so you’re going with them. By the time you feel you can safely leave them unattended, they think that using the bathroom as a couple is just how it works. So, when you disappear for more than two minutes the door opens and there they are wanting to show you their latest Lego creation. Even if you lock the door you aren’t safe from interruption. “MOM! MY SISTER STUCK A SHARP STICK IN MY EYE!” accompanied by incessant pounding on the bathroom door is likely to occur just when you think you’ve found a minute of blissful silence. The translation for this is really, “My sister took all the blue Legos and I’ve punched her but can run faster than she can to make sure you hear my side of the story first making it less likely I’ll get in trouble for hitting her.” Even once they are teenagers, if you don’t lock the door you’re likely go get a visit from someone needing a band-aid, a finger nail clipper, or just wanting to see if you have $20 so they can go to a movie with their chums and five minutes might mean life and death if they don’t get to you now. If you do lock the door they won’t just quietly go away but knock, make their request, and then sit directly outside the door waiting for you to emerge, giving periodic reminder knocks just to make sure you haven’t crawled out the bathroom’s secret escape hatch. So, there I sit. No toilet paper and no kid in sight. And, I know there is very little likelihood that either is going to show up any time soon. Toilet paper has yet to fly. Despite many attempts, I have not been able to levitate inanimate objects to date. The kids’ work sensors have gone off. Yes, their work sensors. Somehow, without you uttering a word, kids know when work is imminent and will quietly disappear faster than donuts at church on Sunday morning. Over the last five years, I’ve come to a startling realization…I’m getting old. I’ve always kind of wondered how it happens. At what point do you go from ignoring the speed limit, wearing hip clothing, and being able to operate the latest electronic gadgets to driving at least 5 mph under the speed limit, wearing polyester, and eschewing all this “new fangled” technology? I’m here to tell you that point comes somewhere around age 35 and sneaks up on you. My initial warning sign was when I got a new cell phone four years ago. I read the manual (that right there was a clue). And, while I was reading, it dawned on me that I’d never remember how to do any of this stuff with the phone and that carrying around the manual with the phone was probably not cool. Then, there was an incident a couple weeks ago where I had to ask my 12-year-old how to operate my iPhone. Now that was embarrassing! I’m an A+ certified computer technician. The latest installment of aging came for me this week as I took two of my children to summer camp. Let’s just say, kids these days have it too easy. Camp used to be about two different things: 1) having fun in the great outdoors and 2) roughing it. Having fun in the great outdoors is still a top priority, but man, has the definition of roughing it changed. As a youth, I had attended three different camps over a period of about ten years. 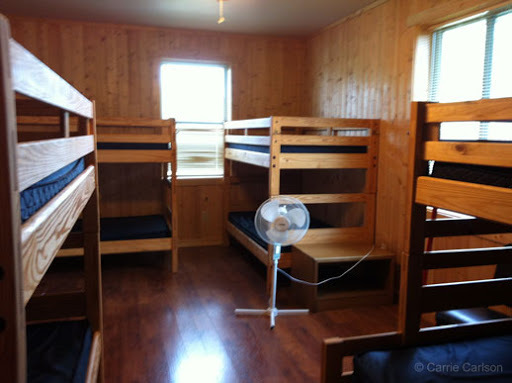 None of those resembled something even close to what has awaited my children at two different camps they have been to when it comes to roughing it. My first camp experience during the summer between my third and fourth grade years and again the following summer was at 4-H camp. We slept about a dozen girls in a glorified storage shed on homemade bunks of nailed together economy studs coated with enough lead-based paint to lower our IQs by 10 points. There was a single bare lightbulb in the rafters and no electrical outlets. No fans, no air conditioning. Bugs and spiders lurked in the corners and made some of the girls scream like, well, girls. There were flushing toilets and showers, but they were located locker room-style in the shower house. And no matter how long you showered, you never really felt clean because you’re camping and camp shower houses have bugs and dirt and are designed to only cover basic hygiene–not cleanliness. Girls Scout camp during my fifth-sixth grade summer was even more rough. Our accommodations consisted of an army tent erected on a wooden platform in the woods with metal-frame beds. If your bed got too close to the edge of the platform, it fell off and you ended up taking a two-foot tumble into poison ivy. The bathroom/shower was a descent hike through the woods. Obviously, being in tents, we had no electricity of any kind, no fans, and no air conditioning. At night, you hoped the rustling you heard outside the tent was just the wind and not some crazed raccoon looking for your candy from the camp store. It was another seven years before I returned to camp. The summer between my freshman and sophomore years of college, I worked as a counselor at a camp for the disabled. I was back to sleeping with a half-dozen campers in a glorified storage shed. Nothing between us and the elements except some fiberboard siding. We slept on army cots consisting of a wooden frame slung with vinyl. 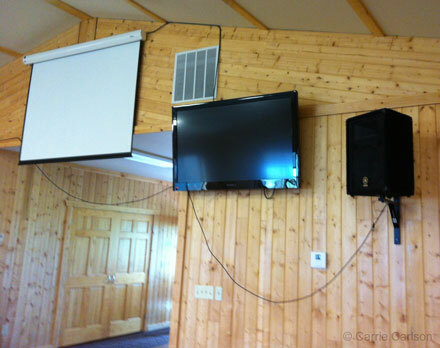 These cabins did have electrical outlets–two of them–one at the front of the cabin and one at the rear. You had to decide if moving air from a fan or music from a boom box was more important. You can likely see where I’m going with this, but I’ll take you there anyway. My first rude awakening came when we dropped our oldest child off for a week at horse camp. Our daughter’s counselor led us to the “bunkhouse”. Fully finished and insulated, air-conditioned, with actual beds, an adjoining bathroom, and a front-loading washer and dryer built in. In all fairness, the camp she was attending has only been in existence since 2002 and has been specifically designed to be 100% handicapped accessible so all campers can enjoy the experience of summer camp. I do have to give them points for that. But, man! It did resemble a four-star hotel more than any camp I could think of. I comforted myself with the thought that our middle child, whom we had seen off on the church camp bus earlier in the day, surely couldn’t be having that cushy of time. Well, that fantasy came crashing down later in the week when we went to pick the middle daughter up at camp. She gave me the grand tour of their “cabin.” Same actual beds that they had at horse camp, adjoining bathroom, insulated walls, air-conditioned, a gathering room with a large-screen flat-panel TV (for movie night or rainy days, I’m told), and actual furniture that didn’t look as though it had come off the spring-cleanup pile in someone’s driveway. Not quite as spiffy as horse camp, but only because the camp itself isn’t as brand new. 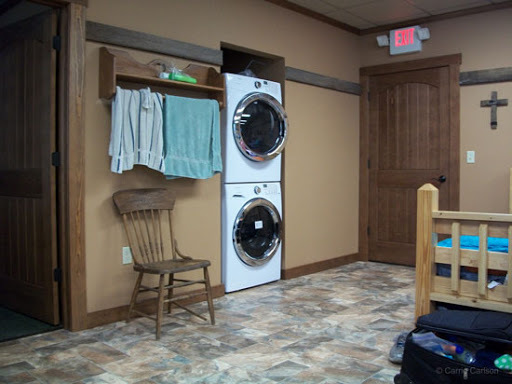 The amenities are part of renovations made at a the camp, which itself has been around for decades. All I could do was shake my head. My days at camp at a youth were some of the best times of my childhood. We spent the days hiking, canoeing, swimming, doing crafts, playing games, and just being kids–or young adults helping kids be kids. Where we slept, ate, and used the facilities didn’t matter one iota. That was just what camp was and was supposed to be. And, I suspect, many of today’s kids would feel the same way if given the chance. More than likely, it is us adults who help out at the camps and the “safety police” that demand such luxuries. So yep, kids these days do have it too easy, but we have no one to blame but ourselves–the grown ups. The kids don’t decided what kind of amenities to have at camp, we do. And, if they have comfortable beds and air conditioning, we gave it to them. Why have we given it to them? Because we are getting old and want the comforts of home when we go along as camp chaperones. Getting off an army cot isn’t pretty, or easy, when you’re pushing 40. And sleeping in air-conditioned comfort for the two plus decades since our last camp (or college housing) experience has left us spoiled. So, we in turn are spoiling our kids in our efforts to be good, supportive, involved parents. It’s hell to get old! Making our what seems like daily trek to WalMart, the beggar is hard at work on the corner. I don’t know if he’s there everyday (because, contrary to what it seems like, I do not really go to WalMart everyday), but a lot of the days I do go, he’s there. I’m not even sure it is just one guy. I think there are a few who take turns. Can’t be sure though because I never look close enough for long enough to be certain. Prolonged looking would be staring and that’s rude. It would also make the chances of making eye contact greater, and then I’d have to feel guilty that 1) I got caught staring, which is rude, and 2) that I didn’t give him something. Of course, I don’t really need to make eye contact with him to feel guilty. That’s what I have my 10-year-old for. My children are not accustomed to seeing this type of thing. We live in a rural area with extreme seasons (read 90º+ with 80% humidity in the summer and -20º for days, and sometimes weeks, at a time in the winter). My husband says it keeps the riffraff out, and honestly, he’s probably right. Not that there aren’t homeless/jobless/hungry here, but they are largely hidden. 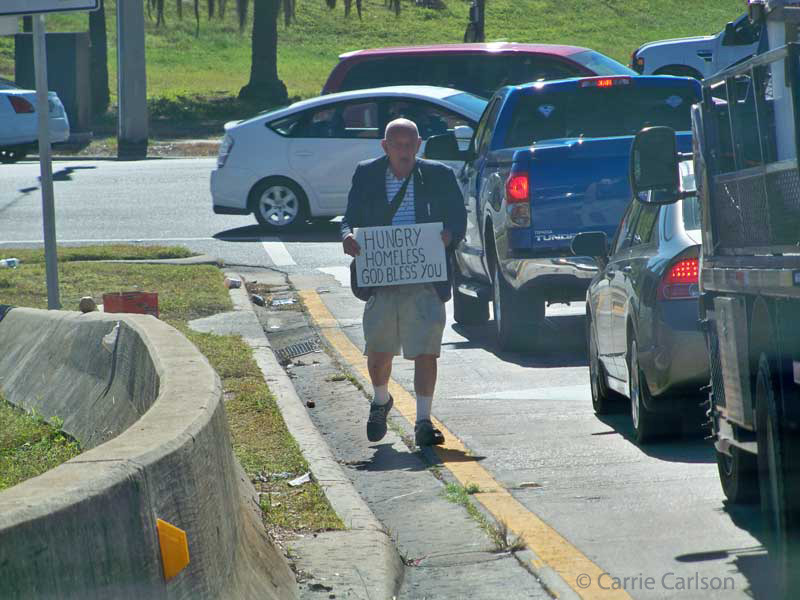 So much so, that when we visited Orlando a couple years ago I took this picture along the freeway because it was something we don’t see everyday–or at least we didn’t until recently. So, she sees this guy on the corner while we’re heading to the store and begins asking questions about why he always stands at that corner. I tell her it is because that corner is really busy and that increases the chances that he will get something. She says she feels sorry for him. And there lies the difficulty. I’m jaded, and she’s not, and I don’t want her to be. She learns in school about the love of Jesus and helping those less fortunate and loving the least of these and knows nothing of the messy issues that make it so hard for many of us, even Christ-professing Christians who read the Bible and desire to imitate Him, to be able to extend ourselves to the guy begging on the corner. I don’t want to shatter her beliefs by telling her how he should get a job like the rest of us, get off drugs/alcohol, that the money he gets probably goes to things that aren’t good for him, and thereby imply that she shouldn’t feel bad for him because his own bad choices put him there (or more correctly, because I think his bad choices put him there–when it comes down to it, I don’t really know what put him there). I don’t want to tell her these things because the world needs people like her who take the message of Christ into the world no matter what the circumstances of those in need. And, then there is the denial factor. I do know that some people genuinely fall on hard times. But, none of us wants to believe we could be the one standing on the corner near WalMart with a cardboard sign and a bedroll waiting for strangers to slip us a buck. We want to believe they’ve done it to themselves, that they deserve to be there because of bad choices, and that helping them isn’t really helping but enabling. If we can convince ourselves of those things, then we can never end up there. Or that’s what we want to believe. As we pass him again on the way home, I’m left wondering how to balance it all. How do I extend help to those less fortunate without encouraging irresponsibility? How do I teach my children about the very real evils of the world without making them jaded and unwilling to help? Because the last thing this world needs is more people like me who look the other way.